WagerWeb is an impressive online sportsbook. They have a great balance of customer service, betting options, deposit/withdrawal methods, sports betting information and bonus cash. Not to mention one of the easist and most accessible websites in the industry. 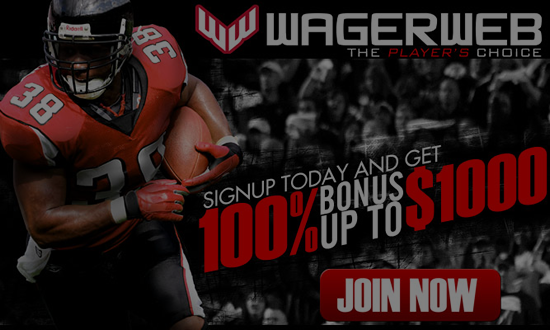 WagerWeb has been doing business for more than 10 years and has earned a solid reputation among online sportsbettors. Wagerweb has an outstanding sportsbetting blog that covers all the major action and provides stats, trends and opinions to help you decide who to bet on/against. You'll get one free withdrawal per month, which is the industry standard among reputable sportsbooks. WagerWeb Review - 100% Deposit Bonus Sign-up. 2% Cash back on all sports bets. WagerWeb offers any future parlay from all sports including: NFL, UFC, NCAAF, NBA and more. Exclusive WagerWeb offer - 200% deposit bonus up to a max of $2000! Best Bonus in the business. Earn redeemable points while betting in the Sportsbook or Casino. Points are good for cash or merchandise. BetOnline Review WagerWeb Review FREE Picks!